Mimicry is a form of flattery. Evolution in the digital landscape holds no bounds and does not adhere to traditions of photographic manipulation. Visual language has been with us since cave painting. Thus it always comes down to the truism that art is language… …and nothing is new. It’s all about presentation. 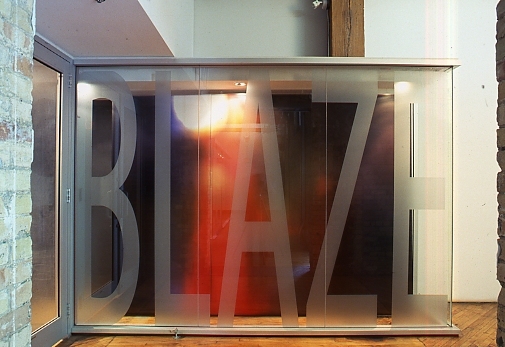 Rebecca Diederichs’ BLAZE activates YYZ’s window space. Blaze, the word, literally makes the spot. This Blaze in all its glorious connotations provokes. This Blaze perplexes. This full-scale title is integral to the work; its size and demarcates its importance. This Blaze evokes movement. Montage comes to mind. Disparate elements are juxtaposed to create new meaning. This emphemeral installation harkens back to filmic form in a digital age. REBECCA DIEDERICHS grew up in Alberta, moved to Toronto in the late 70’s and graduated from the Ontario College of Art and Design in 1988. She was a founding member of the artists’ collective Place and Show Artists’ Projects, a Board Member of YYZ Artists’ Outlet, the artists’ service organization CARO, and a member of The Red Head Gallery. She has curated, and written exhibition texts, and contributed interviews and reviews to Lola, an art and culture zine based in Toronto and managed by Sally McKay and Catherine Osborne. Diederichs is a member of the artist group Persona Volare(www.personavolare.com), whose exhibition, Canadian Club, took place in 2005 at the canadain Cultural Centre in Paris, France and was shown at Rodman Hall in St. Catherines Ontario in the fall of 2005.